You don't want to use hunting slugs for home defense--use these Brenneke shells instead! These purpose-build 2-3/4" shells fire a one ounce (437.5 grains) slug at a muzzle velocity of 1,378 feet per second. This relatively low velocity produces strong short range performance and cuts down on the risk of over-penetration. It also keeps recoil to a manageable level, enabling faster follow-up shots--an important advantage in a stressful self-defense situation. 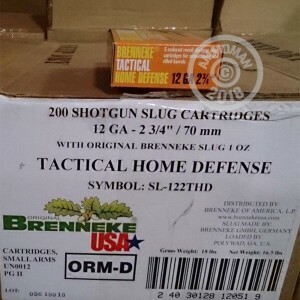 Brenneke slugs are made in Germany and imported to the USA, where they are assembled into finished shells. These boxes contain 5 shells apiece. Place an order for $99 or more at AmmoMan.com and get free shipping--it's a simple way to save on your shooting costs.